A French composer born in 1962 in Reims. An organist by training, and laureate of international competitions, notably those of Kobe (Japan) and Trieste (Italy) and of the Pierre Cardin and André Caplet prizes, Vincent Paulet led a career as concert artiste until 1994. A pupil at the Paris Conservatory in the classes of Michel Merlet, Serge Nigg and Claude Ballif, he was in residence from 1994 to 1996 at the Casa de Velázquez. An heir to César Franck, Gabriel Fauré, Claude Debussy, Maurice Ravel, Francis Poulenc and Henri Dutilleux, he is in a line of French composers and of a music that has a propensity to the sacred. An intuitive composer, he is guided by a musical approach of thematic invention for variation. 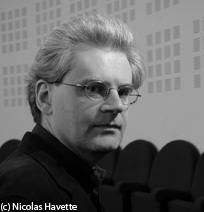 Vincent Paulet is also teacher at the Lille Regional Conservatory. His works include Laus (1992), Psaume 129 (1997), L'office des adieux (1998, a State commission), Le grand stellaire (premiered at the Présences festival, 2004), Volcanique (2009). FALCINELLI Sylviane. Vincent Paulet ou la fécondité des contradictions. L’éducation musicale, 2005, n° 521-522, p. 40-42.